I get asked all of the time what my favorite paint color is, or my “go-to” color that I recommend more than others and use myself. The answer to that question is very easy for me; Repose Gray from Sherwin Williams. Honestly, I feel that Repose is hands down, the best paint color out there today for many reasons that I wanted to really explain today. 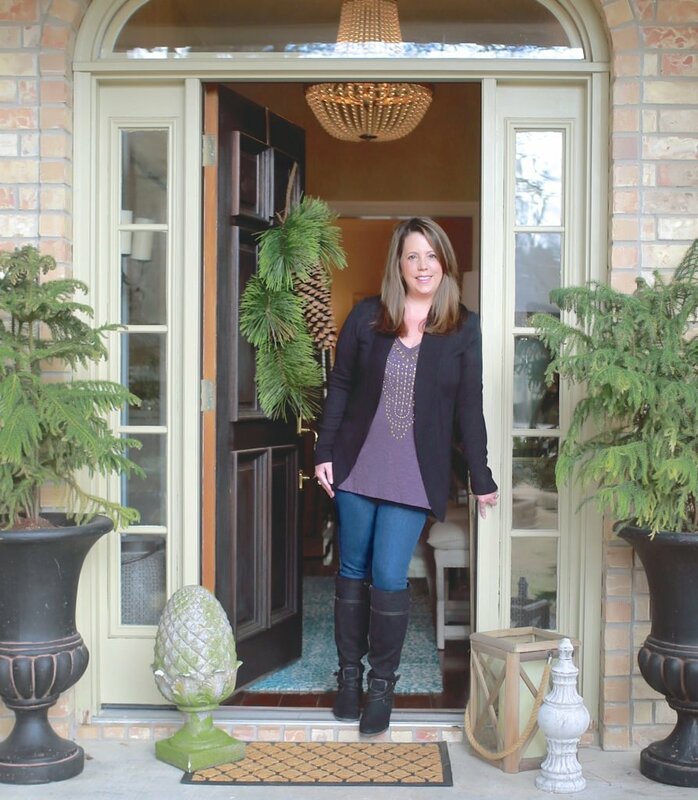 Recently, I worked with my friend Stacey to choose both interior and exterior colors for her newly built home. Stacey and her architect/builder husband Reed (RBS Builders), are in the final stages of completing construction. Their home is absolutely incredible (the details, the design work, the lines, everything). I can’t wait to share the exterior and more of the home with you guys when it’s finished. 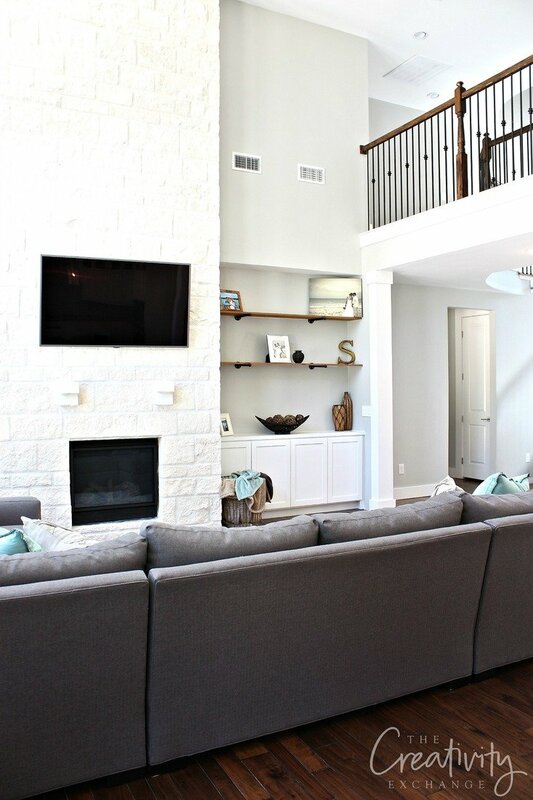 Repose Gray is one of those very rare colors that looks amazing in almost any light, which is why it’s the perfect whole home/open concept paint color. In spaces filled with a lot of natural light, it can look white with a very slight hint of warm gray. In spaces lacking natural light, where artificial light is the main source, Repose looks like a lighter mid-tone warm gray with that perfect balance of warmth and gray. It never looks too gray or too tan. Often times, when I recommend Repose Gray to people, they are hesitant because they think that the color will be too cold or gray. Don’t let the gray in the name fool you, it’s really a combination of warmth and gray, as you can see in all of these images. 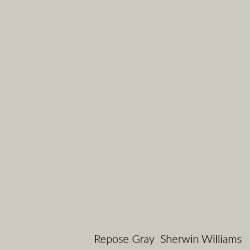 Repose Gray from Sherwin Williams is about as close as you can get to a near perfect paint color. It’s always the first color I recommend for many different types of projects/spaces because it’s so versatile. Thank you so very much to Stacey and Reed for allowing me to share their home and if you want to see how the progression of their home from the beginning and follow along to watch the finishing touches, you can see more on their Instagram here. If you’re interested in looking through some of the past Color Spotlights, you can find them here. 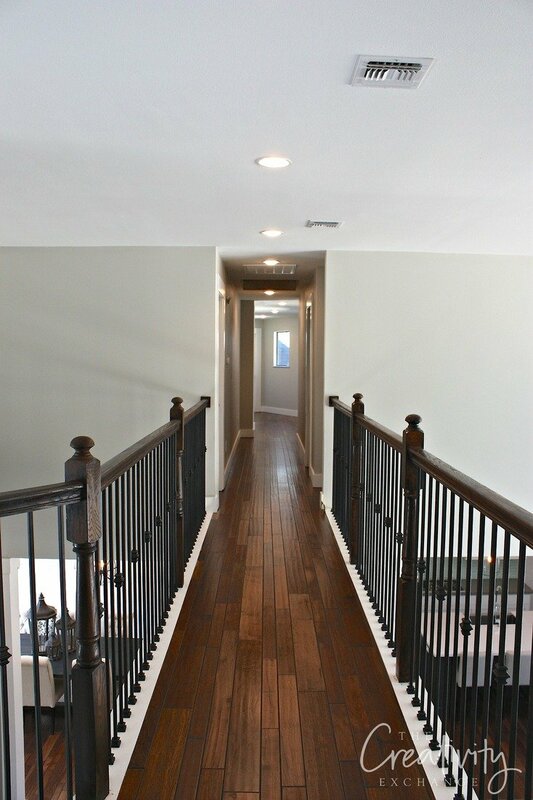 I love how that color looks with the other elements, like the dark wood floors, metal spindles, and painted white trim! Speaking of floors, would your friend be willing to share what flooring was used. It’s absolutely beautiful! We are looking to redo our flooring and that’s exactly the color and texture I was hoping for. It is made by Vanier and is an engineered handscraped walnut, random length/random width. I plan to use respose gray but need a dark – dark shade for an accent wall. Can you suggest a color. I am going to do an accent wall in Felted Wool! What accent wall color do you like with Repose Gray Cindy in a bedroom? What white did you use for the trim. I love your combination of finishes! Decorator’s White from Benjamin Moore was used on the trim throughout the house and all the cabinets. You don’t see it used as often for trim but I recommend it a lot because it has no undertone. It sort of takes on the colors around it, or rather it compliments the surrounding colors. It’s about as true of a white you can get without being a bright, bright stark white but no strange undertones that will jump out in the evening or in artificial light. Thanks for stopping by! Now I’m kind of curious – a super, super, bright, stark white with hopefully no to cool undertones is exactly what I’m looking for. =o Do you know of any off the top of your head? What white shade of trim color do you normally use with Repose Gray? If I wanted to paint a bedroom in RG and a ceiling in a blue shade, which blue would you recommend? (This would be the master bedroom) In fact, there is a small attached master bath. Would you paint the bath in RG or the blue that would go on the master bedroom ceiling? I’m looking for peaceful and serenity and spa like. Thanks in advance! By the way, I love you main picture! We are getting ready to paint our entire home. The timing of this post is excellent. Our home is a 1983 colonial with all separate rooms, no open concept at all. I do have a few questions. What white shade of trim color do you normally use with Repose Gray? If I wanted to paint a bedroom in RG and a ceiling in a blue shade, which blue would you recommend? (This would be the master bedroom) In fact, there is a small attached master bath. Would you paint the bath in RG or the blue that would go on the master bedroom ceiling? I’m looking for peaceful and serenity and spa like. Thanks in advance! By the way, I love your main picture! We are switching out our white colonial entry door with 1/2 sidelights to a double door so this picture is a wonderful visual for me!!! What a beautiful home Cyndy. 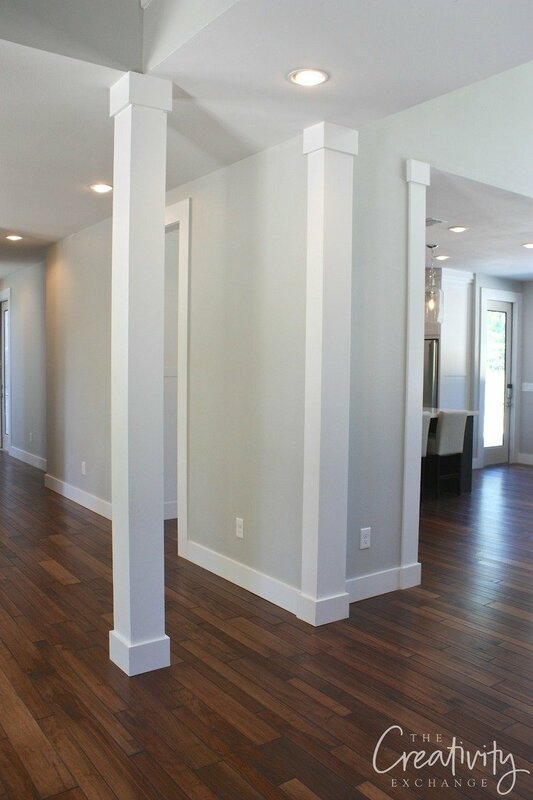 Repose Gray does work so well with the dark floors and white trim!! Could you possibly found out where your friends purchased the dining room chairs in the picture? I’m in love with them…..Thanks! I have grey hardwood floors Dover white trim and charcoal colored couches. The walls are currently green and making the couch look blue. I need a grey that will look grey and make the couch look charcoal,Please advise!!!! I’m about to paint my house this color, but curious if this is full strength or if it was lightened at all in these pictures? It’s beautiful and exactly what we’re going for. We just painted our kitchen cabinets in Repose grey. Love love love it! It does seem, at least in our use, to take on a blue/grey hue. Our kitchen does not have a ton of natural light in it. Have you had this experience before? We just painted our kitchen cabinets in Repose grey. Love love love it! It does seem, at least in our use, to take on a blue/grey hue. Our kitchen does not have a lot of natural light in it. Have you had this experience before? I just painted my home in Repose Grey and it looks blue. I have energy efficient lights so we are going to try and switch them out. Hopefully this will help! Thank you for your reply and tip! It’s a smaller kitchen (100 year old home), so we don’t have a lot of overhead lighting (pendant over the sink and island light with 6 candelabra bulbs), which might be a cause as well. I will check our bulbs at home but I do believe they are a soft white. We love the color as is, just had some trouble with paint on our walls (tried Site White from SW which ended up looking almost exactly like our Repose Gray cabinets). We’ll get it all worked out! 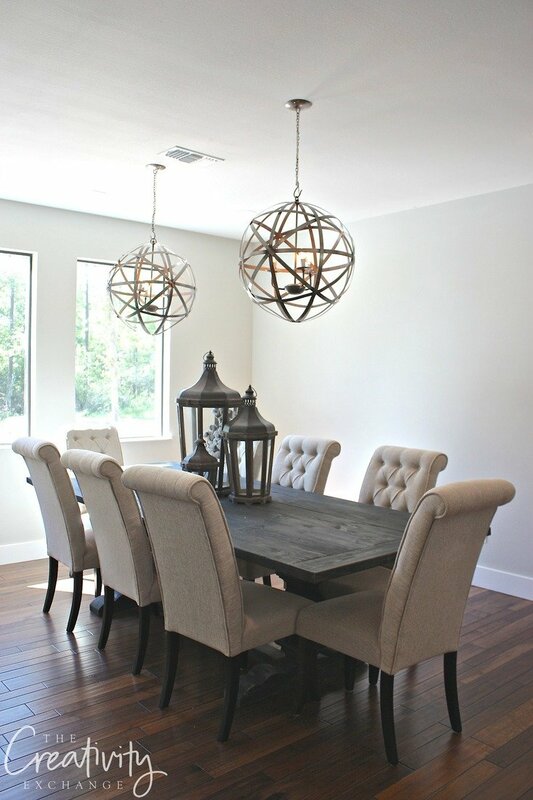 Where can I find that dining table and chairs? After a lot of searching for the perfect color, we have decided to paint our living room, dining room and kitchen Repose Gray! I’m very excited about this change! We are just finishing having our cabinetry in our kitchen and living room painted Super White by Benjamin Moore–love it!! We have an accent wall in the living room which has a fireplace and three white builtin bookshelves. I’m thinking of painting that wall BM Kendall Charcoal. Do you think that is a good choice or can you recommend something dark that would go better with Respose Gray? Please give me your opinion of a Charcoal gray for an accent wall that goes well with repose gray. Would Kendall Charcoal be a good choice? We are using SW Peppercorn as an accent wall with Repose Grey. I absolutely LOVE the peppercorn color. We are painting our basement which is fairly large with only one small window. We have installed lots of new potlights though. Would repose gray be too dark? I guess I should have added that we were also considering Agreeable Gray. Any idea where those awesome chandeliers in the dining room came from? 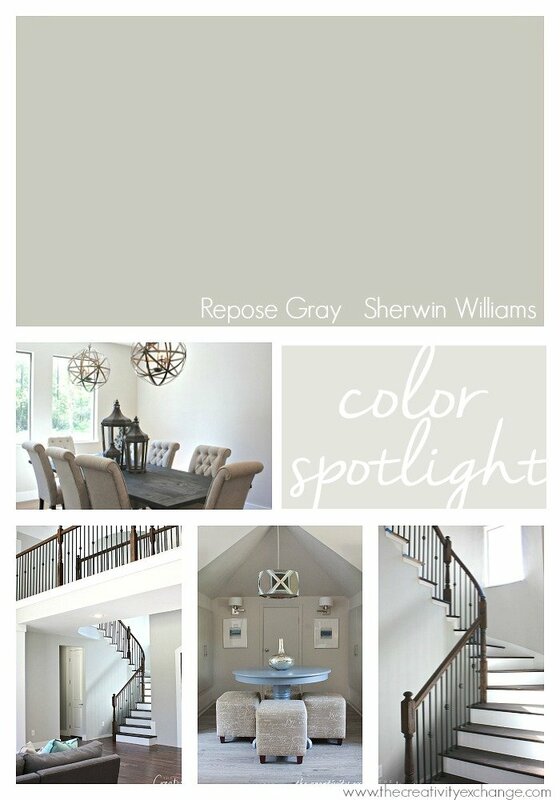 I’m loving the repose gray, I think we will go with that too!! I just painted my home in Repose with SW Extra White trim. I didn’t plan on repainting my ceilings, but feel like I may need to now. They are swiss coffee from BM. What are you’re thoughts? What color white would you recommend if I should repaint? Should I do a flat extra white? 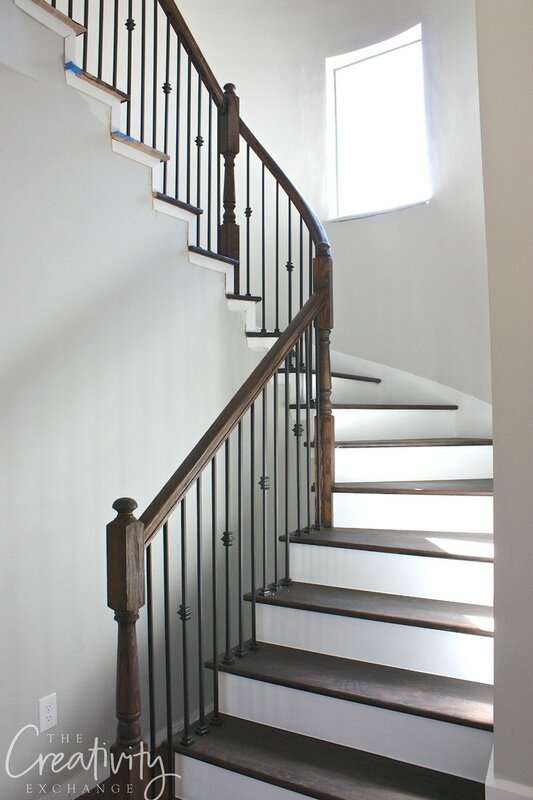 Do you know what stain was used on the stair banisters? I’m renovating my oak wood stairs and love the color! I also have Repose Gray throughout my house and I love the way the two colors look together! What colors do you think compliment the Repose Grey? I painted my kitchen repose grey (and it’s a open concept). I’d like to change the color in the living room and hall way but want a smooth transition. Also what trim color would you recommend? I’m about to paint my house and love the look of repose gray in all your pictures. Is the finish in eggshell? We are thinking about painting our house in Repose Gray. Our living room has a white carpet and we aren’t wanting to change that. Do you have any suggestions for the type of gray/style that would go well with a lighter carpet? Our floorplan is open so the living room flows into the kitchen, which has wood floors, maple cabinets, and granite countertops with more browns than grays in it. We are also considering going gray in the kitchen, or maybe doing a color. Just not sure what we should be looking for with the lighter carpet! Wow, Repose Gray sounds perfect for your home with those combinations. I would actually point you towards accenting in Black Fox by Sherwin Williams in all your accents. Black Fox is the darkest color on the same color card as Repose, so it has the same undertones. Black Fox is actually a very dark almost black gray/brown. It would be gorgeous in your color palette and would work with everything. Then you could accent with throw pillows and other accents in other colors more easily. I hope that helps! Keep me posted! So what walls would you paint with the Black Fox? My house pictures are below…how about going repose on all three walls in the living room then Black Fox on the back wall with the fireplace? Gorgeous ! Where is the dining room set from? I am having my home painted inside next week and chose Repose Gray as the color. My question is what color would you recommend for the ceilings? I do have a fair amount of large crown molding that I would like to stand out so don’t really want white ceilings as the crown is already white. Would it be best to have the ceilings and walls all the same in Repose Gray or is that just too boring? All the wood work in the house is white with dark wood floors and there a large amount of windows with good lighting. That’s the most “blah” house I’ve ever seen! Where is the COLOR!!! Like others, I’d love to know where the dining set is from? Anyone able to help???? Hi Jessica! The homeowners made the table. They patterned it after a Restoration Hardware table. Thank you! Just stumbled on your great site. We are building a house with a great room, dark wood floor, white kitchen cabinets, fireplace, many high windows. I must choose no more than five colors not counting a trim in alabaster. The palette provided does have repose gray, which will probably look great throughout the great room, kitchen, dining area and loft space upstarirs. I have a master bedroom and bath downstairs, a study and a powder room just off the entrance foyer. Off the loft upstairs is a finished bonus room and two bedrooms joined by a bathroom. I could really use advice. Thinking of respite for the powder room and study; blissful blue for master bedroom and the bath; kilim beige for one bedroom; tradewind for another and bath in tradewind and bonus room (spacy) tradewind ; Laundry-tradewind. Other blues are resolute, dockside, balmy, notable hue,something blue, languid. Grays are upward, jubilee, online, gray screen, argos and there are beiges like accessible. I would never have considered repose but now am liking it. Just need to make a decision. Sincerely appreciate your help. Hello, what is your opinion about repose gray vs revere pewter from BW. I am struggling between the two and worried that repose might be too cold. Thoughts? Would fundamental white work well witb Repose gray? Im trying to do a two tone wall. we are going to use repose grey to renovate my moms home that was distroyed in the hurricane. Her walls are cypress. we are looking for a wood look tile for the floor. Something not too expensive. Home depot and Lowes have several responsible ones. Do you think a grey wood look would match ok? Yes!! It would be perfect! I have Repose in my craft room with grey wood floors and it’s the perfect compliment! Good luck! Wow, what a great post! Can you help me out with my paint choices in our dining room/living room renovation? Our floors are light grey maple (ultra-flat finish, with nickel stain) and two walls in the dining room will be BM hale navy. Do you think that BM moonshine or SW repose gray on the other four walls will be equally good complementary choices? Also, what white do you recommend for the trim (including crown molding) and ceiling? PS We live north of 60 and our space has tons of natural light in the summer, but very little in the winter. Thank you Karen! I would steer you away from Moonshine and point you toward Repose. Moonshine has some slight green in the undertone. Repose would look beautiful but you should know, Repose will take on a very slight cooler gray in spaces with a lot of natural light. It’s really pretty either way and would be so perfect next to Hale! I always recommend Benjamin Moore Decorator’s White for trim. I think it’s hands down the best! Keep me posted! Well, our nickel-finish wood floors arrived and they have a much warmer/pinky-taupe undertone than we were expecting. The effect on the Hale Navy is not great. So now we are thinking of BM ‘old navy’ or ‘stunning’ and are hoping you have a colour recommendation for the other walls (as I now worry that Repose might not be warm enough). I’d sure appreciate your thoughts. Hi Cyndy, I also have a question in regards to SW Repose Gray. We are planning to use this color throughout our open floorplan. We have a brown rust couch, and wondering if Repose would compliment this couch? Also we will purchase 2 recliners, but not certain what color to use with the gray and brown rust. Another dilemma I am having is what color to paint kitchen cabinets? There will be a large island which I would like for it to be somewhat darker. Could you please help? Thanks for any advise you could give me. If you have any questions please email me. I love Repose Gray and used it before. We just purchased a new home and I would like to paint all the walls Repose Gray again. The trim, doors and kitchen cabinets are painted Simply White by BM and in some areas really show a cream undertone. Do you think Repose Gray will go with the trim and help make them less cream or should we paint all the trim in the house as well? Hi. I am painting the exterior of my home in repose gray. I plan to use black fox for the shutters and doors. I was planning to use eider white for the trim, but was wondering if I should get something lighter since it is only one shade off from repose gray? Any help is much appreciated! hello! I have decided to paint my walls Repose Gray . I am having lots of trouble deciding the trim and cabinet color. I have narrowed it down between Alabaster and Dover White? Could you help me in the right direction? Thank you for your time! Great article and recommendations. I would love to get your take on what type of finish you recommend for trim (semi-gloss, satin, etc.). Hello Cyndy! Thank you for spotlighting Repose Gray! We recently moved into a house with yellow oak floors, oak cabinets and built-ins. Will Repose Gray work with this? I was planning to paint my kitchen cabinets either SW Creamy vs BM Simply White, though I am veering toward the latter (the Creamy turns faintly green in my kitchen). My family room faces Northwest and is shaded with oak trees (more oak!!! ), kitchen is SW but without a lot of natural light. Please help! We are building a home that will have painted brick exterior. I really love repose gray and plan on using it through most of the interior. But I really want a very very light gray on exterior too. Would repose be good for that?? I’m planning on the exterior trim being white and shutters very dark. I would really appreciate any help you could offer. Thank u.
Hi. LOVE this Look! I am building and chose Repose gray for my interior as well. I love the warmth of the floor against the wall color. What stain did you use? Hi Cyndy, We are using Repose Gray for walls in open floor plan. In the kitchen we have a black granite countertop – kind of like uba tuba. We are also getting new wood flooring throughout first floor, mid to light-tone brown. Asking for your guidance on kitchen cabinet color, trim choice, and darkness of floor. I can’t seem to put the scheme together! Please help. I love repose gray but want a blue accent color that is not too dark. Do you have any suggestions? We are likely going to use repose gray in our foyer/staircase/hallways, but I’m looking for a light purple-gray color to use in our kitchen/family room. Can you suggest a purple-gray from Sherwin Williams that would pair well with repose gray? All of your thoughts on color are very helpful. Thanks for taking the time to post. 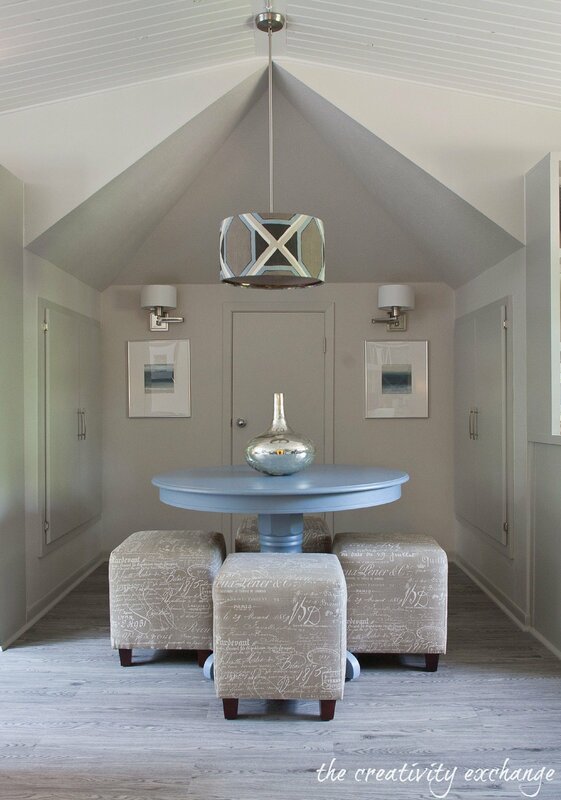 In our sunroom I’m thinking of using mindful gray on the walls or repose gray with white trim. I was thinking of using something besides white on the ceiling. Do you think Dorian gray would be ok? Are would that be too dark? What would you suggest for that room. Also, I need 2 accent gray colors for the walls and trim for my charcoal doors and windows on the exterior. Do you have a suggestion? Would mindful gray work with charcoal for the exterior? Thank you. It looks lovely. I need a grey that will never look blue. Is this it? As a surprise while we were on vacation my sister had our downstairs painted. The entire first floor is painted Marilyn’s dress by Benjamin Moore and it looks hideous. It’s blue. I have a light turquoise couch and many pieces of artwork featuring pools. So I cannot have the walls be blue in anyway. And I love the idea of a light gray. Please help. I feel guilty that I am so ungrateful but it was a personal decision and I’m kind of annoyed that she did it. Tess, Don’t give people you house key. I just painted my bedroom in Repose Gray. I had 5 different paint samples splashed across my walls for over a week while I tried to decide on a color. the first gray I tried came out too blue, yuck. that’s the whole reason I settled on Repose Gray, no blue. it’s perfect!! 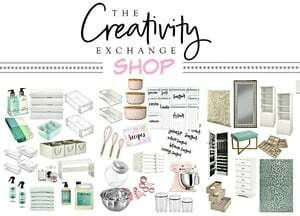 Now I need to paint my upstairs family room and that is hw I came across this blog. I was looking to find something that will go nicely with the Repose Gray. As for your sister, I would tell her I loved the color but something about it effects my eyes and gives me a headache. I hate to repaint but the doctor says it’s a must. or…….you could go to her house next time she is out of town and paint her living room a cantaloupe color. My kitchen cabinets are alabaster white . I have white subway tiles and grey countertops and grey floors. Planning to paint the walls Respose Grey.I do not get direct natural light. Would Respose Grey work for me and if so what ceiling and trim white should I use. Would repose gray be ok with Dover white trim? Thanks for your website and taking the time to answer questions! I am painting my kitchen Repose Gray with cabinets and trim BM Chantilly Lace. 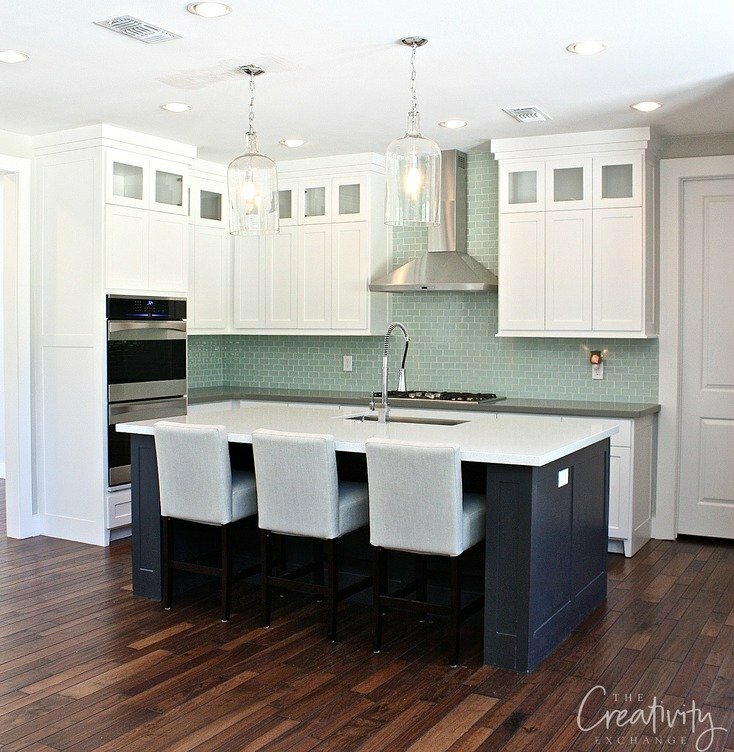 My kitchen is not open concept but I still would like a color to use in my living area that goes nicely together with the kitchen and flows. Couch is taupe, floors mid-tone brown hardwood, black chairs, vintage wall unit in a walnut wood and some touches of red and cobalt blue for accents along with white drapes and an accent chair. The room does not get a lot of direct light. Currently it is painted Nomadic Dessert and appears too dark for me. Any suggestions? We’re trying(!!) to pick colors and think we have it narrowed to Repose Gray or Gray Owl. We live in a townhome with a row of sliding doors off the LR/DR facing north with a small screened lanai off of it. The opposite end is my kitchen (open concept) with the entry door leading to the stair and one SMALL sidelight next to the door. Our floors are Santina Cherry vinyl plank and we have light grey/blue couches with pillows that have teal/taupe/rust in varying shades. I’ve put up foamcore painted samples and still cannot figure out what will really work. The walls are currently a pale green that need to go. I’m afraid to go too light, but then when the color goes up the stairs and 2nd floor hall with limited natural light, I’m afraid of too dark. I see no clear delineation in order to change colors between one room to the next, either. Thanks for any help! I am a huge fan of repose white and mindful gray. My question is we have a very large open concept floor plan with vaulted ceilings and White oak teamwork throughout. The floors are character Hickory. Kitchen cabs and Island are white and counters are a gray quartz. NOT tons of natural light. Theres a 15ft see through repurposed wood FP that kinda divides the kitchen area from Gt room area. My concern is the hickory floor. So much variation in the color and we have large sofa sectional thats dark gray and cherry wood other furniture pieces. Will Repose Gray work, I am thinking any other color will be to much action with this floor. Love your ideas! I am stuck!! We are painting our new townhome (hopefully this week) and I wanted to use a warm light gray. My furniture is neutral and I have a navy blue rug/decor. Floors are neutral tile. I thought I had settled on Repose Gray when painting pieces of poster board, but when I painted the sample on my walls, it is completely darker! We are afraid of the place looking dark and closed in, as there is not much natural light. BM Gray Owl looks very blue where we do get natural light. Crushed Ice is too light as it literally matches the furniture. What is a lighter version of Repose?? Btw, we tried Repose at 50% and the color completely changes, so no luck there. Gossamer Veil? Moonshine? Im so confused! Hi, i’m using Repose Gray in our new home. I want to add a few accent walls in some of the rooms in charcoal. What color would match repose gray? And I want light gray cabinets. What color should I use? I appreciate your input. I’m having a hard time making a decision. Hi, I am repainting my whole house and am excited about your reviews on Repose grey. My kitchen cupbords are spice maple which has a more orange look. Would Repose grey still work? what slightly darker color would you recommend for the dining room which flows from the kitchen and what white color would go well for the trims? We have dark wood wood work…a cross between cherry and walnut..what grey would you suggest? My townhome has very little natural light! Kitchen has sliding doors facing south, that is the only natural light in that room. Living room has only one south facing window. Dining room has no windows! Would Repose gray be light enough? Does it work well with a red brick fireplace? How does it compare to Nimbus Gray? Thank You! Thank you!! One final question! The entry way has 15 ft walls with cathedral ceilings. Red brick fireplace in dimly lit basement! Would repose worth throughout? Where is dining room table from? Hi Cyndy, love your blog! I just got home with a gallon of Dorian Gray paint for my bedroom. OOOOps, it is too dark ( only one window) I have built-in cabinetry in a creamy beige color, so I thought this might be a good contrast. Any suggestions as to what % lighter I could ask SW to mix the Dorian Gray to keep me in a soft gray? After reading your post on Mindful Gray, I painted my bathroom cabinets in MG and oh my goodness, how beautiful. Hi Cindy I hope you can answer me rather quickly. We are having our home built and painted in another state and it’s hard not being there. The are only allowing one color throughout. It’s a one level open floor plan with lots of windows. I, doing white kitchen cabinets with white subway tile white grout and stainless steel appliances. A darker wood floor and I have white IKEA furniture. Would repose gray work or it be too light with all the white? Thank you!!!! We have recently painted our kitchen cabinets Repose Grey. We had our Walls Nuance. We think the colors of the walls and the cabinets are too similar. Can you recommend a color for the wall that would go with Repose Grey and Alabaster trim. I would love to have a white with a tint of green or blue in it! Thanks. I just painted an open concept basement apartment in Repose Gray and love it. I still need to paint a brick wall( that’s been previously painted ) which has an electric fireplace in front of it. The electric fireplace has a dark wood trim. The floor is a grayish-brown weathered looking wood. I’m not sure whether to paint the brick in Repose Gray or the next shade darker. my gut says to paint it the one shade darker.. forgot the name of the color tho? 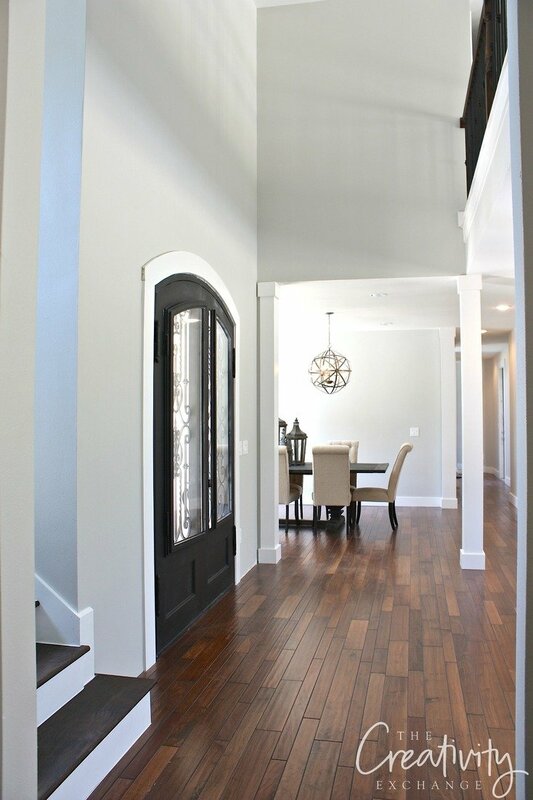 I was in a large model home recently and they had the entire trim out, doors in that color.. walls were alabaster beige. it looks amazing.. I am building a home and using repose gray on all my trim, I sometimes regret not going the one shade darker. Your description of your space sounds beautiful with the worn looking wood.. trim.. either would be fine.. I just prefer contrast. I’ve read through all of the comments and am feeling pretty hopeful! We are building a new home and have decided to paint the walls throughout with repose gray using the BM Decorator’s white for the trim. No one mentioned a coordinating cabinet color. Do you have any suggestions? I like to keep things as simple as possible, so I’m trying to use the same cabinet color in kitchen, laundry room, and bathrooms. I don’t want the color to blend in to much with the walls. Any suggestions would be so appreciated! I love all the pictures. I am planning on painting my walls repose gray, I have white cabinets and grey tiles in the kitchen. I will follow your suggestions of using Bright white for the ceilings throughout the house, but in the kitchen I have wood planks and beams I want to sand and repaint. I was wondering what is the color of the kitchen island and the main entrance door on your pictures? I want a dark brown like that, but which brown would look good with repose gray and white cabinets? Hi we are painting our finished basement Repose Gray. What color carpet would you recommend to go with? Beige or light gray? Not sure if light gray walls work with beige-y carpet, but afraid light gray carpet + light gray walls will be TOO much gray! I’m so glad to have found this post! My floor is red oak. My cabinets and hand-railing for the stairs are all cherry. I plan to pain my trims SW Dover White, which is an off white has you had noted in one of the comments. Would SW Repose Gray work for all my walls in this case? Hi Cyndy . I am in LOVE with Repose Gray thanks to this blog. Also Stacey’s home is absolutely stunning. Does she was any carpeted room? If so what color carpet did you guys select to go with the Repose Gray walls? What color carpet would you recommend to go with Repose Gray??? Would reprise look good with red accents ? Would you recommend Repose Gray for an exterior? I’m considering Repose or Agreeable Gray with extra white. Thoughts on those? Our house faces South. I have a design dilemma…! My exterior siding is very similar to Repose Gray. Siding is on the sides/back of house bottom to top. However, we have slight lighter red/orange brick on the front. Currently the past owners pulled an ever so slightly darker Repose around the front trim…but it looks so drab against the brick and turns a greenish grey. We need to paint our trim, so we are looking at a lighter trim color that is not white. This will hopefully make the house more cheerful. Since Repose is so light, I will either go with at light cream/off-white color or use a shade almost equal to Repose, but with more of a stone cream to it. I can’t figure out what to use. We are looking at Natural Choice or Neutral Ground (and .thought about Balanced Beige – but doesn’t seem to look quite right). Any suggestions? We will have Black shutters. The brick is reddish orangey pinkish. Thanks! Love this post!! HELP => Thinking of changing walls throughout the entire main living/kitchen space to SW Repose gray on walls, for trim your suggestion of BM Decorative white or possibly SW pure white (I think off the top of my head that’s what it’s called) my delima is doors (interior) I can’t do white since I have a cluster of doors close together an it’s too much white for me lol so wanting to go with a few shades darker but will still go with Repose gray on the walls. 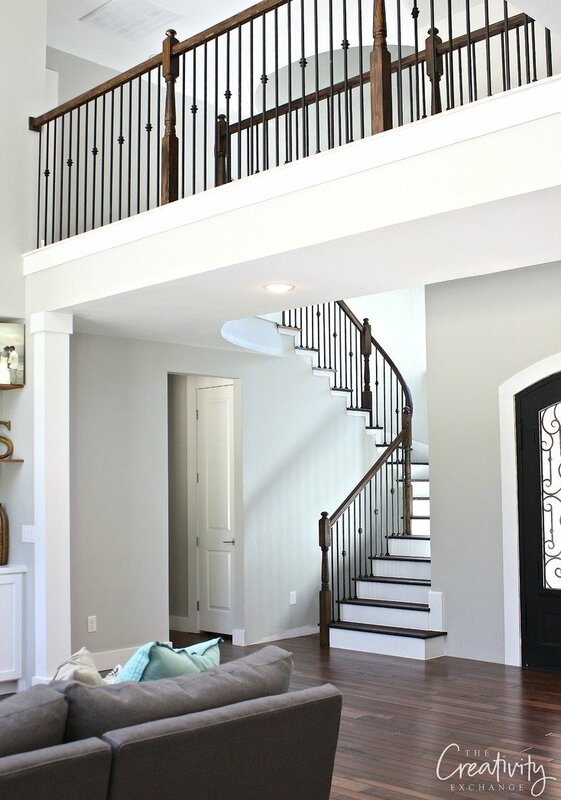 What colors on stair rail and stair steps? If you have an abundance of natural light, any white or light gray can sometimes appear blue. Often times it depends on which direction the space is facing, which is why it’s so important to test the color first to determine what your light is going to do to the color in the space. You can get a blue appearance if there are any reflections like a pool, lake, etc.. I have a pool that is less than 8 feet from my bedroom and everything in my bedroom reflects blue. How does the color look at night? Does it still look blue? If so, something is wrong with the formula or a color was running out in the color formula machine, which has now happened to me twice. Did you by chance color match or did you buy the paint directly from Sherwin Williams? This color spotlight gives me life! And such good information captured in the answers to the comments as well. I love the photos of this house! I am in the process of painting my home Repose Gray throughout. I was looking for some good accent colors to use on a couple accent walls – and also to use on kitchen cabinets (My husband said no white cabinets, so need something darker). Do you have suggestions?